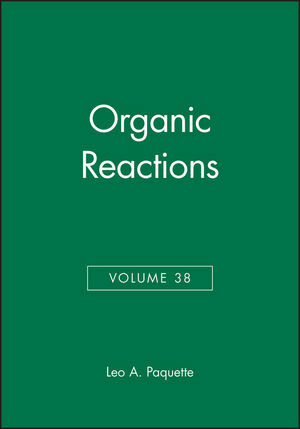 The volumes in this series are collections of essays devoted to a single reaction, or a definite phase of a reaction, of wide applicability. The subjects are presented from the preparative viewpoint and particular attention is given to the limitations, interfering influences, effects of structure and the selection of experimental techniques. Each chapter includes several detailed procedures illustrating the significant modifications of the method. The Peterson Olefination Reaction (D. Ager). Tandem Vicinal Difunctionalization: B-Addition to ,B-Unsaturated Carbonyl Substrates Followed by -Functionalization (M. Chapdelaine & M. Hulce). The Nef Reaction (H. Pinnick). Chapter and Topic Index, Volumes 1-38.